Along time, we, Imperial Brass Component, have grown as top notch quality manufacturers, exporters and suppliers of premium ranges of brass products. Our product range includes Brass Pipe Fittings, Brass Compression Fittings, Brass Flare Fittings, Brass Hose Fittings, Brass Valve Fittings, Brass Sanitary Parts, Brass Gland Fittings, and Brass Anchor Fittings .Our supremely experienced and highly qualified professionals are completely committed towards offering the clients excellent quality products. The products are stringently tested on various quality parameters, so that product quality remains at par with leading industry guidelines. We are highly renowned and appreciated for following rigorous controls like material control, process control,machining and dimensional control. We make our products available at the most affordable rates and various certification and supplementary tests are also performed to ensure that the products remain defect free. We follow smooth, transparent and highly ethical business policies; which help us in serving our esteemed clientele, located across the whole of the Indian Subcontinent. Under the visionary leadership and guidance of our CEO, Mr. Naresh T. Kothiya, we have mastered the art of offering remarkable quality products which are utilized in various sectors. His vast industry experience, perfect client management policies and immense domain expertise are the chief reasons of our outstanding growth and success. Manufacturing and Trading of Brass Pipe Fittings, Brass Compression Fittings, Brass Flare Fittings, Brass Hose Fittings, Brass Valve Fittings, Brass Sanitary Parts, Brass Gland Fittings. Our Brass Products Division is constantly indulged in the process of offering supreme quality and service during the complete procedure of designing to delivery. Then there is our Engineering Department; whose exquisite job is to develop everything from prototypes, to product modifications. They are also given the responsibility to improve the designs and manufacturing techniques. With the help of our state-of-the-art technologies, our engineers offer supreme quality of field support; which also consists of custom design work. 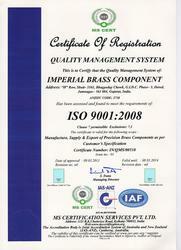 Constant improvements in quality standards are the focus of our extensive programs. These programs cover all manufacturing phases, starting from incoming raw material and continuing to machine standards. Moreover, due to our flexible assembly, packaging and shipping systems we are able to fulfill all the requirements of our clients’. These even include parts combined in a "kit"; which are ultimately useful for various applications, custom labeling, and packaging. We offer satisfactory customer services when it comes to fittings and valves. Due to excellent quality and durability, our products are highly preferred by our domestic and global clients. These products are developed for successfully catering to clients’ requirements. They are also widely used in applications in diverse areas and industries. Moreover, we follow perfect client management policies and the products are developed completely in accordance with their specifications and the recent market trends. We always follow leading industry guidelines and thus are able to expand our client base. Our team includes highly experienced, hard working and dedicated professionals who are our strength. They have vast industry experience, are adept at handling clients’ issues and inputs in a balanced manner and are completely aware of the latest and most advanced market trends and developments. With the help of their valuable experience and skills, we have become capable of developing products which adhere to international quality norms and clients’ inputs and suggestions. Furthermore, their vast industry exposure and detailed market understanding helps us in fulfilling the requirements and demands of our clients in effective and reliable manner. Our team members perfectly co-ordinate with each other, and thus we are able to guarantee hassle-free work procedures in our organization. We offer high quality continuous training sessions to our team members; so that we are able to develop a world-class range. Moreover, our professionals are the sole reason that we can adequately market our varieties of non-ferrous products at the global level. We have shown tremendous growth as trustworthy manufacturers, exporters and suppliers of a varied range of Brass Products. Developed and fabricated from high quality materials, our products are highly desired by our national and international clientele. Some attractive features of our products are supreme quality, optimum durability, economical prices, longevity and perfect usage and maintenance.